The Kengeri Satellite Town adjacent to Mysore Road is now a busy township. Kommaghatta road is one of the major roads in this area. It connects this region with Tavarakere in Magadi Road. If you go along this road, or on any of the adjoining roads, past NICE road, you will see the latest site development project of BDA called Nadaprabhu Kempe Gowda Layout. Look a little deeper, and you will see that it is an environmental disaster in the making. This has been a green belt providing valuable oxygen supply to the city and it is suddenly turning red. Perhaps this was expected as `Kempu’ in Kannada means red! Every day, you will spot several earthmovers and trucks moving about and converting coconut plantations, fruit orchards and grazing areas into barren layouts. The layout development here is noteworthy in that it is taking a very different shape as compared to past layout developments. The new layout is spread over a very large area of thousands of acres in disconnected blocks, with many villages in between which remain as they were before this development started. The BDA has not acquired these areas. The only thing BDA seems to be interested in here is levelling and dividing the land into sites and allotting them to make some money. Perhaps this so-called development is inevitable, but one wishes that it would be done with proper planning for the future. Currently we don’t see new water supply channels. It appears that all new owners of sites will be expected to dig their own borewells for water supply. Those who are lucky and strike water would also start selling water in some time. Soon most borewells, including those of farmers in the nearby villages, would go dry. Meanwhile, the BBMP would plan some new pipelines and ask for more water from Kaveri, Yettinahole, Arabian Sea and so on. On the other hand if we look at the ponds here, most of them are neglected, with a lot of silt accumulation. There is also rampant misuse of water bodies, with people using the ponds for washing their vehicles, dumping idols etc. Only Kommaghatta Kere seems to be in reasonably good shape and attracts a lot of water birds. One can see that BDA is converting some of the streams from the existing lakes into cemented canals so that the water gets drained out quickly, as the image below shows. This is environmentally bad for several reasons. Firstly crabs, birds etc which need these streams will have no place to go. Instead of utilizing the excess water, BDA treats it as a problem for the layout! While planning new layouts, BDA should not only clean up and improve the existing lakes, it should also build new lakes so that layouts become self-sufficient in water. This is entirely possible given the amount of rain Bengaluru gets. I am sure Kempegowda would have built several lakes if he were to plan further expansion of his ‘Benda-Kaaluru’. Kommaghatta-Tavarekere road is the only wide road connecting this layout with Bangalore city. The layout is expected to have thousands of sites and apartments and so a good road network should be there in the plan. There should also be a separate direct link road to Mysore road. This region has been a favourite of cyclists and trekkers. It would be great to have separate paths for the cyclists and trekkers so that they don’t have to jostle for space with automobiles. It is feasible if the planning is done now. It is clear that some greenery would be lost forever in the course of this development, but with the right steps this can be mitigated to some extent. For instance, it has been traditional in Bangalore to have some area in front of the house for gardening. One or two coconut trees and some flowering plants for puja is what you could always expect from your own land. Unfortunately, the trend of 30×40 and smaller sites, crammed together next to each other, don’t leave much area for such luxury. BDA itself should set aside the gardening area in-between roads and house sites so that some greenery is ensured. Of course, this would reduce the number of sites that the BDA can have, but it would increase the value of these sites and many people who want to escape the pollution of Bengaluru city would be interested in such green sites on the outskirts. This year, most of the area has turned dusty and brown with red-soil exposed everywhere. As the rainy season arrives, there will be a lot of erosion and top soil would end up silting the streams and lakes. If past experience is anything to go by, even if site allotments are done this year, it would be several decades before people actually come and settle down in this layout as essential amenities and services such as water, schools, shops are missing. Meanwhile Parthenium and many other weeds are bound to thrive in these sites and some sites will become garbage dumping grounds. It is never a good idea to have vacant plots. I strongly suggest that these plots be afforested immediately with a variety of plants, which require minimum care. This would turn all the sites into gardens and mini urban-forests. Permission to cut these can be granted on case-specific basis only when building plans are approved. Indeed, such an idea can be thought of for the whole of Bengaluru to make use of vacant plots and improve the city’s green cover. The existing villages and other establishments have to be integrated in the planning. Otherwise, villagers would be left out in the development process. With most of the grazing grounds gone, many who are dependent on animal husbandry are losing their livelihood. Already roads passing through these villages are very narrow. Further, haphazard growth of buildings in these villages would be a disaster. It is surprising that no media is covering the ground realities of development in Kempegowda Layout. There should be a Committee of Experts, to make a comprehensive plan just for this large layout. Views and needs of allottees as well as villagers should be taken into account. That way, this can be developed into a model layout in a systematic way. In view of the current ground water levels and fertility of the soil, it should be possible to develop this layout into a lush green layout, resembling the posh private gated communities. Key to it however would be planning and implementation of the plans, before it is too late. Riding an expensive cycle seems to draw people’s attention to the price of the cycle, rather than the rider who is actually riding a “clean green machine”. 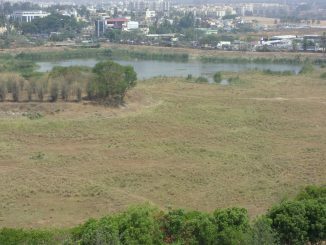 High Court order puts Agara lake back into LDA’s hands. Citizens too want to protect the lake. In response to a lawsuit filed by the Classic Orchards Property Owners Association in south Bangalore, the High Court recently ordered the BDA to ensure that real estate developers relinquish roads, parks, and civic amenities as per approved plans. I cycle regularly in this area. I pass through Visweshwaraiah Layout from near D group all the way to Hosakere Lake. Have seen the area from Kommaghatta lake go from an absolute green haven to red barrenness. Only those who took advantage of a loophole to “convert” their lands to nurseries ensure some greenness. This is not just restricted to KG layout. All the way till Tavarekere the redness is spreading. Who actually goes and lives that far?! There was absolutely no reason for this layout. Less than 10% of Visweswaraiah Layout is currently occupied. Given the abysmal construction rate there, the only purpose of this layout is to add to the coffers of BDA. I also blame Bangaloreans and their obsession with BDA sites as investment. Time to open your eyes and see what damage your “investments” are doing to the city. We are a cancer spreading all around the city, destroying everything that comes in the way. It is also time BDA it shut down. They’re doing more harm than good to the city.